Colorful and fragrant Spazazz Aromatherapy Crystals set the mood, arouse emotion, and relax your state of mind. Whether it is romance, self-assurance, or peace of mind, the emotional benefits of aromatherapy are always desireable, so add a few capsules of Spazazz Crystals to your bath or Hot Spring Spa. These fantastic fragrances will enhance your spa experience, most definitely! 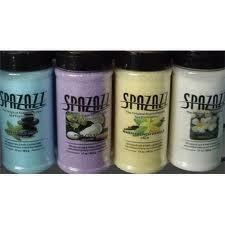 Spazazz is specifically formulated to be safe for hot tubs, baths, spas of all brands and models. It will not clog filters, motors, or jets and will not affect the PH Level or water chemistry. Spazazz does not foam or bubble, and is safe for all spa surfaces. There are a lot of “cheap smelling” spa fragrances on the market. Take a look, but better yet order some of these amazing fragrances. Your hot tubbing experience will never be the same! -You’re not in Seattle anymore, baby! Order from our Olympic Hot Tub Company e-store. Save $2.00 on each bottle of crystals. You will be very glad you did!